Register Now for PhilHealth Nationwide Run 2013! After the successful conduct of PhilHealth Run: Mindanao Run for Hope in Koronadal City last year, the regional office of PhilHealth here in Region 12 is once again gearing up for another PhilHealth Run. 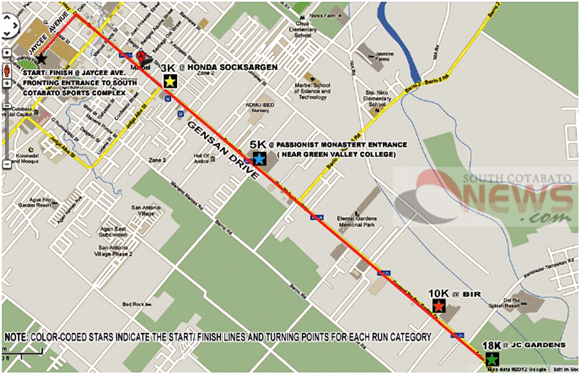 To be held on February 17, 2013, PhilHealth offices in the region are now accepting registrations for the Koronadal City leg of PHILHEALTH NATIONWIDE RUN 2013 a nationwide running event which will be held simultaneously in 18 different sites all over the country . Part of the proceeds of PhilHealth's nationwide run in Koronadal City, will be donated to PRO XII’s local beneficiary: the Reception and Study Center for Children of DSWD Region XII, a 24-hour residential facility located at St. Gabriel, City of Koronadal that provides social work interventions for abandoned, neglected, abused and exploited children 0-6 years old.